LS14250-MR ((C52005, FBT030A, NP8P-BT)) Mitsubishi PLC Controller Lithium Battery. Type: Lithium. 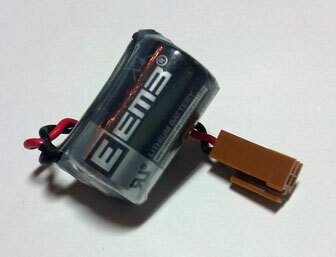 Voltage: 3.6 V. Capacity: 1200 mAh. Height: 25 mm. Diameter: 14 mm. Replaces: Fuji FBT030A, Toyo Denki NP8P-BT battery, Mitsubishi C52005 battery and more. Works also with Xerox 490 and 980 printer systems, part 101K 53788. This LS14250-MR Lithium PLC controller battery fits several Mitsubishi PLC controllers. It is a DIRECT replacement for the Fuji FBT030A, Toyo Denki NP8P-BT battery and Mitsubishi C52005 battery. This Mitsubishi LS14250-MR PLC battery comes with a one year manufacturer's warranty.